The USGA golf handicap system allows players of different skill levels to compete. Golf handicaps are established in order to permit players of varying skill to compete against one another at an equal level. In order to establish a golf handicap index, you must first join an approved golf association that provides USGA handicap services. The minimum number of 18-hole rounds required to establish a handicap is five, which are subject to peer review by other members of the association. After you have played more than five rounds, your handicap index will be based on your best 10 rounds over the past 20 entered. Join a golf association in your area that provides USGA handicap services. Many public and private golf courses in the United States will provide the handicapping services for an annual fee. 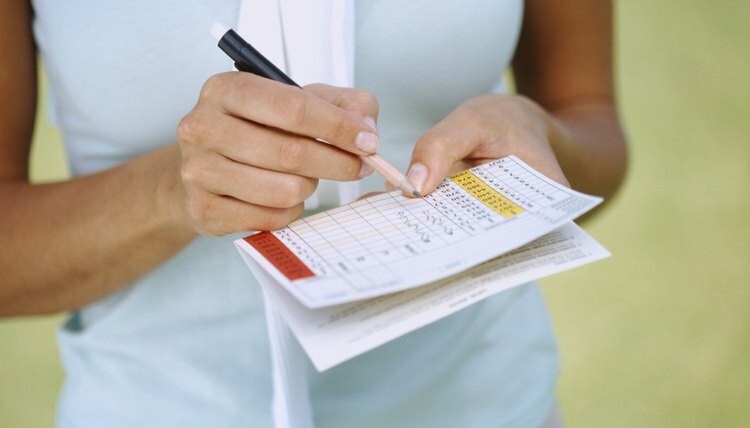 Many golf associations also offer electronic access to the Golf Handicap Information Network (GHIN) which allows you to make electronic score entries and to check your data from any Internet-connected computer. Enter your five most recent 18-hole rounds into the GHIN computer or turn your scorecard in to the golf association handicap committee. Rounds that are less than 18 holes in length cannot be used for handicap index calculations. View your initial handicap index on the GHIN computer after entering data from your fifth round. If your golf club does not provide GHIN access, the USGA will mail a handicap index card to the mailing address you provided when joining the club. Continue to enter completed rounds for all courses that you play. You will need to keep the scorecard from all courses that you play in order to enter the course slope rating for the tees that you used for the respective rounds. The GHIN system will provide real-time updates to your handicap index. If your golf club does not provide GHIN access, the USGA will periodically send a new handicap index card to you as your handicap changes.